At first sight, this appears to be a blatant promotional effort on behalf of The English Concert (who are celebrating their 45th birthday), one clue being calling it after themselves, rather than the composers or music it contains. I think that image is unfortunate, as the music and the instrumental soloists are of the highest order. It is based on the composers and performers connected with the many early 18th-century European court orchestras, several of which proved to be pioneering musical hothouses, albeit depending on the whims of the current princely ruler. The featured soloists are Nadja Zwiener (violin), Tuomo Suni (violin), Joseph Crouch (cello), Katharina Spreckelsen (oboe), Alfonso Leal del Ojo (viola), all regular members of The English Concert rather than bought-in soloists. 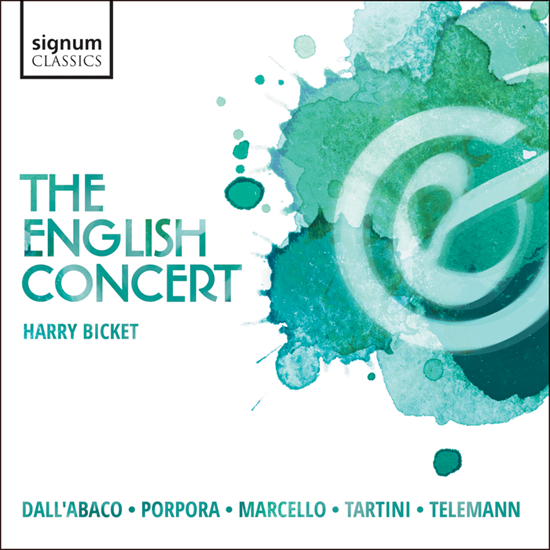 Since it was founded by Trevor Pinnock, The English Concert has become one of the best-known and most respected of British period instrument orchestras, and that is demonstrated on this recording. Under their current director Harry Bicket, they have consolidated their position, not least for exploring fascinating corners of the repertoire and for their performances of Handel. Only one of the concertos on this recording is likely to be known (the Marcello Oboe Concerto), and that probably only through in the Bach keyboard transcription. The choice of pieces was given to the soloists themselves, and they have chosen well. I was surprised to learn that this is the first time that the distinguished oboe soloist, Katharina Spreckelsen (a mainstay of many period instrument orchestras), has ever recorded an oboe concerto. The music reflects the cross-fertilization of musical and artistic ideas throughout Europe, the composers (most of whom were also celebrated performers) often moving between courts, spreading artistic ideas in the process. In a recent interview, Harry Bicket explains how he was plucked from the world of an assistant Cathedral organist (one of the team at Westminster Abbey) into playing harpsichord continuo, and then conducting, both seemingly almost by accident. He directs from the harpsichord, bringing both vitality and cohesion to the performances. The soloists are all excellent, and their choice of music apt. So forget the possible promotional aspects of this recording, and just view as an excellent recording of fascinating repertoire by some of the finest musicians around. The programme notes can be found here.